Whoo boy! Talk about an explosive over-reaction to the Fed tapering. The US central bank has tapered their debt monetization from $85B monthly to $75B monthly or $1.02 trillion annually to a paltry $900 billion annually. So the “one-time” TARP bail-out of $700B to save the US banking system and the US economy was so unprecedented that hard assets like precious metals, farm land, and such were driven to extreme levels. The Fed upped that number to a trillion annually and people celebrate because Bernanke has placed a Put under the market. Any threat of excessive inflation in the core CPI has been eliminated and market participants celebrate easing and tapering with virtually equal fervor. These are truly interesting times for investors. And since it is the most wonderful time of the year, why not get a seasonal bump in equity prices too? Everyone deserves to feel wealthier. It’s the American way. I recognize that things appear to be looking up economically in the US and since America controls the world’s reserve currency, that should positively affect the rest of the planet. GDP is slowly but surely looking up as some growth projections show anywhere from 3.5% to 4.1% for the US in 2014. Core CPI is tamed so who am I to dispute or rain on any of this optimism? All the same, I think we should visit a list of some things that just don’t seem to matter anymore in the world. We’re looking predominantly in the financial world, but we can’t avoid a couple of views on politics either. As usual, I’ll trot out some charts to help illustrate the good and bad, where applicable. 1. To get the party started, let’s start with inflation. It’s one of the touchier economic subjects out there. There are those who are of the opinion that observing the core CPI and its tame 1.2ish% is the total story. 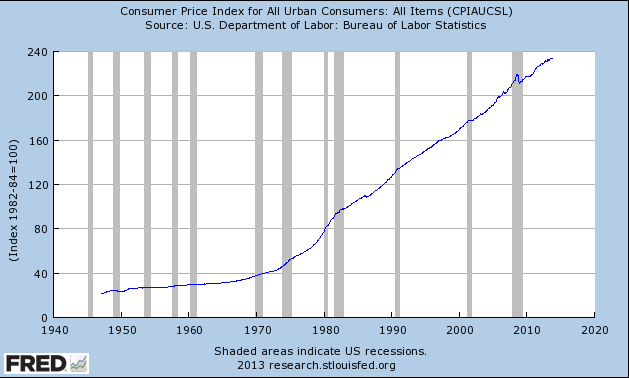 That of course ignores the following chart of growth in the CPI since the 70’s and the advent of excess credit to fund the American lifestyle. The funny thing about core CPI is that it excludes energy and food, aside from housing, the two biggest components that hard-earned money is spent on. Additionally, hard assets and financial assets are ignored by the focus on core CPI. Hard assets(ex-precious metals) have been rising like gangbusters in 2013. Fine art, diamonds, fine watches, fine & classic cars, and farmland are all being sold for record prices. Is this asset price inflation irrelevant? How about equity prices in 2013? Is the rocket ride across all indices simply a matter of business fundamentals? Partly. Multiple expansion? Partly. Worldwide liquidity tidal wave? Definitely. Does it really matter though? Wealth is growing…or at least the Fed thinks people will perceive their wealth to be growing and thus spend more to organically grow the economy. The fact of the matter is that the YoY rate of change in the core CPI has been basically flat, or as neo-Keynesians and monetary sophists say, non-existent. Since monetary inflation is apparently meaningless, this means that the Fed has everything under control. If or when the need to tighten up policies to rein in any perking up cost-push inflation, the Fed will pull the appropriate levers and all will be good. That continues to be a prevailing mindset. 2. Debt monetization i.e. QE is simply overlooked as the price of doing business in growing the equity markets. As I previously noted, market participants were aghast at the sheer size of the original TARP. Now we can’t live without it, but it’s tapering. According to a Bloomberg survey of 41 economists, the median forecast is for the Fed to taper by $10B over the next 7 FOMC meetings until there is no longer any sort of QE. Do you agree? That’s a tough one to swallow. 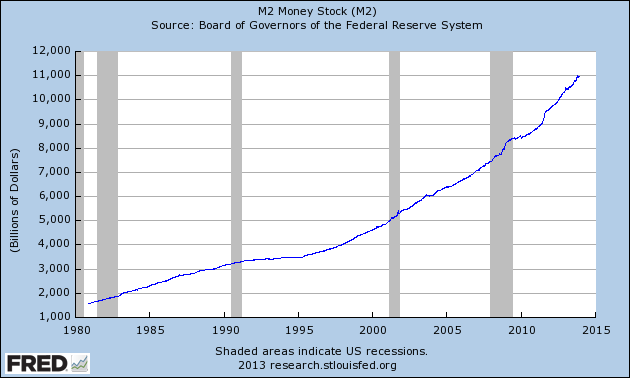 Below you can see the growth in the M2 money stock since the turn of the century. I have read that this chart can be regarded as irrelevant for a couple of reasons. One is that the creation of this money is simply a balance sheet transaction. Federal debts are monetized, but only sit on the balance sheets of the participating banks as excess reserves. Thus, there is not the requisite rise in costs that historically accompany such transactions because those excess reserves are not being spread around. 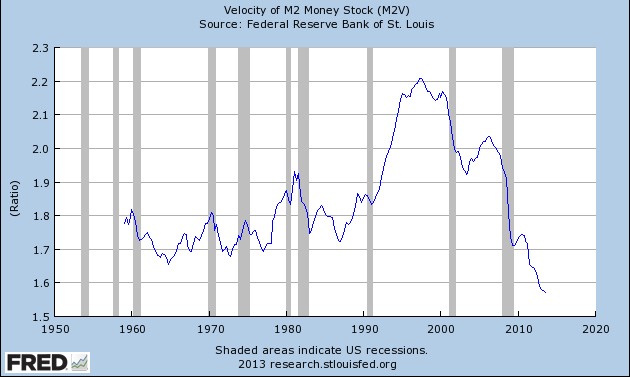 The next chart shows the velocity, or rather lack there of, in the M2 and it’s a major reason why deflationists and current believers in the status quo believe there are no or will be no repercussions for excessive debt monetization. This chart above is leading many to believe that everything is under control. Of course, any rational follower of economics and the markets know that it will be the unintended consequences and unforeseen actions that will shift the velocity upward. And by unforeseen, I mean things that are completely foreseeable such as a shift in international confidence in the USD or a marked increase in the Renminbi for transactional settlement at the sovereign level or a significant reduction in the use of the Petro dollar for energy settlement. The current logic goes that excess reserves will be coaxed out by the banks’ greed for yield and earnings, as the spigot is eventually closed. Then the US should see some of that cost-push inflation that was so widely anticipated after 2009. As it stands, there is a terrifically tight correlation between 10-year US Treasury yields and money velocity. 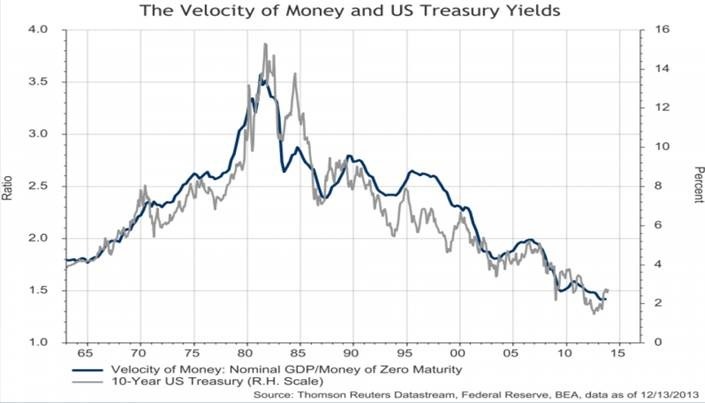 Since everyone and their mother expects the fixed income market to lift the yield of Treasuries, it stands to reason that velocity will be joining the ride. Everything is always about timing, though. 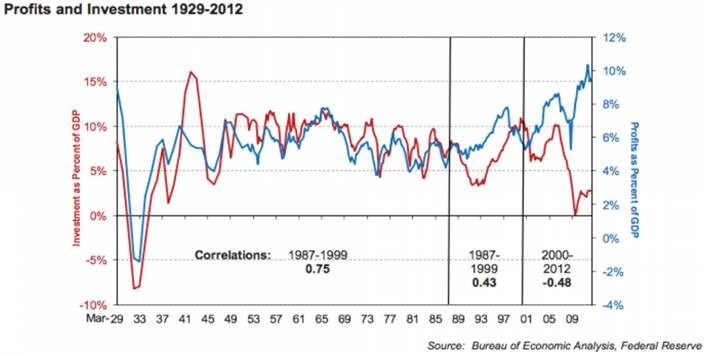 None the less, observe the following chart courtesy of Business Insider, via Harrell at Loomis Sayles. 3. But in the meantime, the co-policy of ZIRP which has helped to enable the efficacy of QE has destroyed what it means to traditionally and conservatively save your money. ZIRP is forcing everyone to speculate, plain and simple. Savings accounts and CD’s pay nothing. Because of that, more and more reach for yield through the dividends of the stock markets. Even the high-yield debt market continues to perform robustly and I suspect it will continue until the T-rates begin to officially rise. 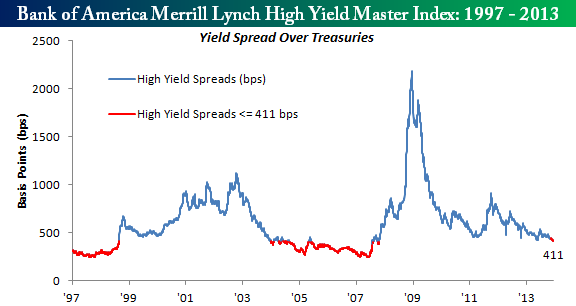 The lack of spread between HY and plain old Treasuries is beginning to hit what, since 1997, has traditionally been the early part of a danger zone. Observe the following chart from Bespoke. It shows we still have some time to go before confidence erodes, but as a canary in the coal mine, a message is being provided loud and clear to those potentially stretching a little too far for yield. 4. Can anyone honestly look at official unemployment reports and not raise an eyebrow? The BLS is currently showing an unemployment rate of 7%. Fantastic! America’s well on it’s way towards full employment again. Except there’s that nagging little fact that the entire demographic of individuals who have given up looking for work are simply not labeled as unemployed and thus do not factor into the equation. So if you gave up looking for work and still don’t have a job, not to worry. You don’t qualify for unemployment benefits anymore and we won’t count you as unemployed because you’ll receive a different form of welfare. Win-win. It’s difficult to ignore the glaring convergence between the reducing unemployment rate and the continued decline in the workforce participation rate in the US. Have a look at the chart below of workforce participation over the last 10 years, courtesy of BI, via Gunha at ISI. The Philly Fed states that this rate is entirely caused by workers entering retirement. Obviously, retirees factor into the equation but to state that the descent, which coincides with the nadir of the Great Recession, is entirely related to retiring workers is bold. “But it’s backed by statistics! I read the report.” Yeah, sure. Ok. Statistics are never presented in such a way to influence the thinking of others. 5. Capital expenditures and the organic growth of the economy are simply not a priority for now. CapEx levels provide that behind-the-scenes, real snapshot of economic growth, and for now, CapEx is in the dumps. Businesses simply do not want to risk the capital to expand or grow sales and the work force. Instead, the current business fads are buy-backs and dividend increases. Selfishly, I’m all about the share repurchases and dividend growth in my own long-term holdings. But to use cheap capital or current cash flows for such short term benefits with little to no thought on how to build for the future seems a bit backwards to me. Getting by with less is SOP for so many corporations since 2008, but at some point CapEx will have to pick up, because SG&A can only be sliced and diced for so long to help generate earnings. Have a look at this chart, also from BI, courtesy of Soss at Credit Suisse. It displays the ratio of business fixed investments to corporate cash flows. You can see it is still at its lowest points over the last 50 years. Corporations just don’t want to spend their money on CapEx. Now that squiggle-pic above just depicts what corporations are willing to spend from out of their own kitty. 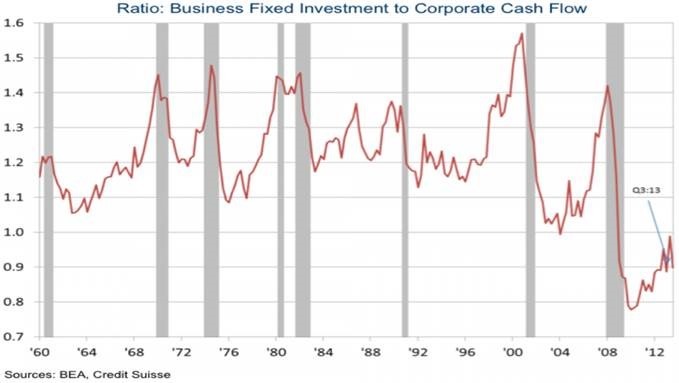 Despite all the access to cheap capital for the corporations to borrow in order to finance the future, there isn’t a pick-up in that area for CapEx either. Observe the following chart, additionally from BI, via Chandler at Brothers Brown Harriman. Just look at that spread on the right side of the chart. It’s very telling of the current methods being utilized to generate further corporate earnings without the CapEx investment to build a solid foundation for future earnings growth. At some point soon though, that spread will begin to converge as the US should see genuine economic progress. Companies will actually begin to invest in their future as opposed to just provide shareholder value through buy-back’s and divvy’s. This is very important, because even though CapEx doesn’t seem to matter right now, at some point it could be a key point in the inflation argument. The scenario has the potential to play out like this: economic growth picks up and so maybe the Fed moves rates up just a quarter percent or whatever. Banks get scared that their Fed window cash machine is going to go bye-bye so they increase lending across many facets of their operations. Companies begin borrowing the still cheap capital to invest in operations and hiring actually picks up. 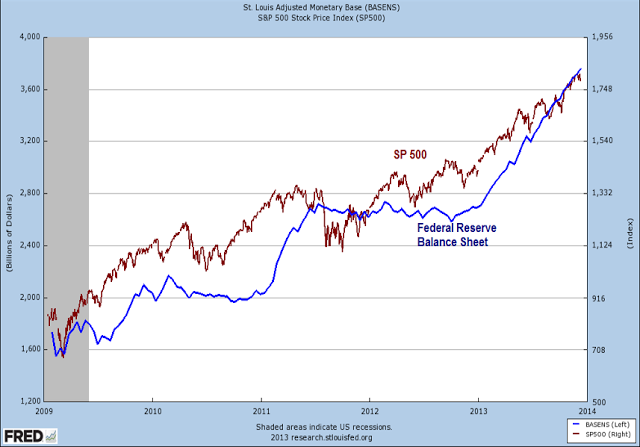 This begins the upward shift in money velocity which should then begin to push prices upward. This is a scenario that investors will want to keep their eyes on, because it has the potential to make you a lot of money as markets grow, but it could be the mask that covers the arrival of the next financial crisis. Because we all know, nobody ever sees the next financial crisis coming. 7. The old banking model is dead and has been dead since the repealing of Glass-Steagall but really even earlier than that with the creation of mortgage backed securities. The so popularly and prevalently quoted old banking model was the 3-6-3 of borrow at 3% – lend at 6% – be on the golf course at 3pm. Banking pretty much used to be that simple. That’s how it should be. Banks shouldn’t be systemically risky to the entire world economy. And if the regulators around the world were actually doing their job, then these SIFI’s wouldn’t be SIFI’s. Banks now simply take in as much capital as they can and use it as collateral across the spectrum of their “sophisticated” trading operations. Why lend to entrepreneurs or businesses in need when you can lend to sovereigns and use that asset as collateral in additional transactions in an endless chain of profit generation. The widespread acceptance of the current banking model is truly a thing to behold. Have a look at a couple of countries from over in Europe who simply appear to be clueless. This chart from BI, via Commerz Bank, shows how the Italian and Spanish banks are simply reflating their balance sheets in an attempt to stay resuscitated for as long as possible before the ECB starts monetizing like they’ve promised. Unbelievably, the entities that need access the most to that capital to help grow each respective economy is barred from access as the banks maintain their favorability to “govie” holdings. There has been so much debt created between the sovereigns and the SIFI’s and so many derivatives are traded underneath it all to keep the illusion of solvency alive that nobody knows what’s what anymore. In a previous post last June, I expounded fairly extensively on the derivatives rife throughout the banking system. Click the link and have a read if you’re inclined. The old banking model is dead and I suspect that even after the next crisis, the system still won’t be cleansed of the systemic risk of the new banking era. If and or when a serious dislocation arrives, I’ll hold out hope for real, positive change that creates a balanced financial platform from which the world of finance, investing, banking, and economics can work. I ain’t holding my breath. 8. I don’t want to go off the deep end of a rant here after sharing what I think I are some important notions to consider in understanding some concepts behind the macro economic and financial outlook, but a couple of comments on statesmanship and justice are warranted. Civic duty in the political arena appears to be as dead as the old banking model. It really seems as if the Boomer politicians with their 60’s era non-inhaling, non-conformity or 70’s era dancing in polyester have forgotten what it means to build and develop a nation. Even the the X’ers in positions of power are infected by the commercialism they were so subjected to as youth. Both groups who control US politics seem to be consumed with consolidating and maintaining a power base, as opposed to building a nation up and maintaining an image of America as a fair, free world power. Obviously, these statements are highly generalized and that’s all I gots to say about politics. As for justice, where is it for the bankers? Where is it for the corrupt? I realize it’s a tired question, but it’s difficult to let go. When you hear responses from Eric Holder on a slew of subjects, you just want to puke…literally. A handful of traders take the fall for the Great Recession. No banking executives are indicted in America, but during the S&L crisis going into the 90’s, hundreds of banking of executives were incarcerated and indicted for their malfeasance. Look at Iceland’s accountability of the executives from their largest banks; convicted and sentenced already. Is Iceland, an island of 300,000 people, a model of financial reform that America should be closely following? Not necessarily. That’s not the point. The point is you have a sovereign nation that held those accountable who deserved to be held accountable in the banking system. Enough about that as well. 9. The last notion on the list of things that don’t matter is volatility in the equity markets. No need to go short or hedge as you can simply go long and outperform on an absolute basis. That’s what ample liquidity across the world does. It drives up certain asset prices, and stocks are the asset du jour to be driven up by current liquidity levels in the economy. Volatility is one of those funny things though, where it doesn’t matter until it does in a very big way. It does appear as if now may be a dangerous time to enter new positions as things seem a bit frothy, but as the liquidity continues to flow and the volatility is non-existent, it may be more imprudent to not get positioned going into the new year. At this point, hoping for a correction just to get the absolute best price on new positions may prove to be unsound. But then again, so could diving into new positions just to potentially play catch-up. For now it does appear as if the economy may begin to mend, and when combined with liquidity levels, ZIRP, and the general trend, one has to position their portfolio accordingly. In my next post, I’d like to share a simple portfolio that may be able to take advantage of the current trends while hedging some of the correction risk; in addition to taking a contrarian stance in some of the positions. If I don’t share another post this week, have a great holidays and happy new year. And thank you so, so much for taking the time to stop by my site and having a read.